Steeped in culture and history, it should come as no surprise that Rhode Island boasts some of the oldest and most legendary theaters in America. From lavish opera houses in Newport to vaudeville spaces in Cranston, check out these 10 incredible historic theaters in Rhode Island. The Newport Opera House is one of 10 still-surviving opera houses in the U.S. and the oldest theater in the state. Built in 1867, the theater was grand and opulent, featuring a staggering 700-seat venue and year-round programming. Sadly, for a time, her halls fell silent as she faltered slightly from her former glory. However, restoration of this historic national treasure has begun, and it is the hope of all involved that she soon be revitalized. The Stadium Theatre is part of a larger complex called the "Stadium Building and Theatre." Built in 1926, it is one of the few “remaining examples of the majestic Vaudeville Theatre era” that is still in operation today. 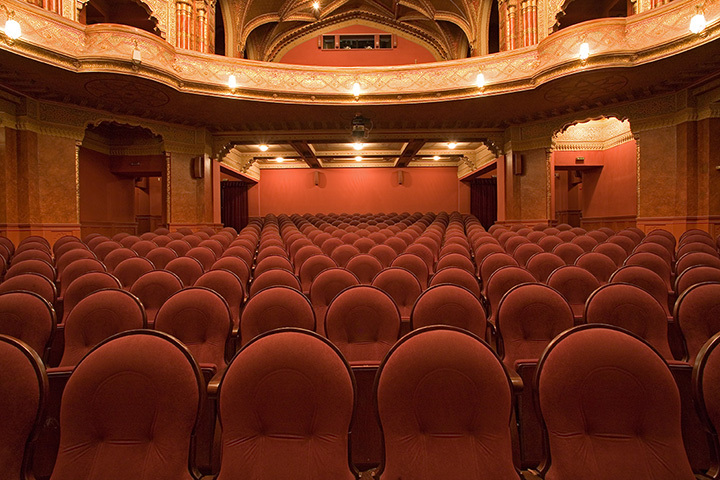 Restored in 2001, the Stadium Theatre has played host to artists like “Liza Minnelli, Cher, and George Winston.” Plus, the Stadium supports community theatre, dance, and music groups. Trinity Rep is a non-profit theater organization that is located in a former historical vaudeville location known as the Emery Majestic Theatre. The Emery was built in 1917 and known for its gleaming “white terra-cotta facade.” Now known as the Lederer Theater Center it houses two performance spaces: one is the 500-seat Elizabeth Theater and the other is the 250-seat Sarah and Joseph Dowling, Jr. Theater. Trinity is a Tony Award-winning theater troupe. The Avon Cinema is an independent movie theater that opened in 1938 with a popular Art Deco design. Famous for showing “first run foreign and domestic films of distinction" it now shows art house, independent, and foreign films primarily. You will also find a vintage, pull-handle candy machine and black and white checkerboard in the bathrooms. This opulent space was built on the Federal Hill neighborhood by a wealthy realtor in 1926 and features “stained glass arch-ways, painted murals, and a Wurlitzer Organ.” Now owned by native, John Berberian, the building features musical acts, theater, drama, and other performances on its historic stage surrounded by an intimate 200 seats. Added to the National Register of Historic Places in 1980, Theatre-By-the-Sea started out as a girls summer camp. Owned by Mrs. Alice Jaynes Tyler, the first incarnation of a theatre came in 1933 when she decided to convert her “old shingled barn into a theatre.” With the help of a Russian actor, a director, and a lighting person, she completed the transformation into a 300-seat theatre that same year. Built in 1958, this firehouse served Newport for half a century. Moving to a new facility in 2011 opened the door for “a community group with a strong desire to promote and support theatre arts” called the Farmers Branch Community Theatre. So soon stumbled upon the vacant building and so the opportunity for a new home. The rest, as they say, is history. The Empire did not at first come into its glory as a theatre. Constructed in 1882, its original purpose was a short-lived roller rink. It wasn’t until a decade later that Empire was converted into a theatre, and, by the 1900s, it was showing silent films to eager crowds. Today, the barn-like structure shows movies and welcomes theatrical performance.